Crystal Palace boss Roy Hodgson insists he would be open to bringing Ruben Loftus-Cheek back to Selhurst Park on loan from Chelsea after Christmas. The English starlet spent last year with the Eagles to continue his development after finding regular playing time hard to come by with his parent club and he earned widespread praise for his displays as Palace avoided relegation. Loftus-Cheek featured 25 times for Hodgson’s side in total, scoring 2 goals and proved his worth in the Premier League, becoming an integral part of the team in midfield while impressing supporters and experts alike with his dominant physicality and composure in possession. His success with Palace earned him a spot in the England squad for this summer’s World Cup and the 22-year-old had a small impact as Gareth Southgate’s men reached the semi-finals in Russia, which saw his stock rise even further. Unfortunately for him, upon returning to club level with Chelsea he has had to contend with even more competition for a place in the middle of the park, after the arrivals of Jorginho and Mateo Kovacic during the transfer window. With N’Golo Kante and Cesc Fabregas also fighting for a spot in Maurizio Sarri’s starting XI, Loftus-Cheek once again finds himself at the bottom of the pecking order at Stamford Bridge and has been reduced to just two substitute appearances so far this season. According to Sky Sports, Hodgson would jump at the chance of securing the Englishman’s services again if the opportunity were to arise, as he told reporters on Friday: “I can’t answer the question ‘is that something you’re looking at’ because how can I look at it? He is a Chelsea player. “I have no idea if he is going to be available in January, so what can I look at? 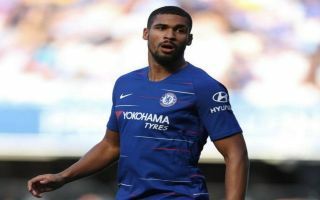 The Blues face Neil Warnock’s struggling Cardiff City side in the next game of their new domestic campaign on Saturday, but Loftus-Cheek is unlikely to be available after sustaining a foot injury during the international break – as per The Sun. His luck doesn’t seem to be improving at the moment and should he continue to be left out of the side in the coming months, a return to Crystal Palace in January could well be on the cards for the Chelsea misfit.